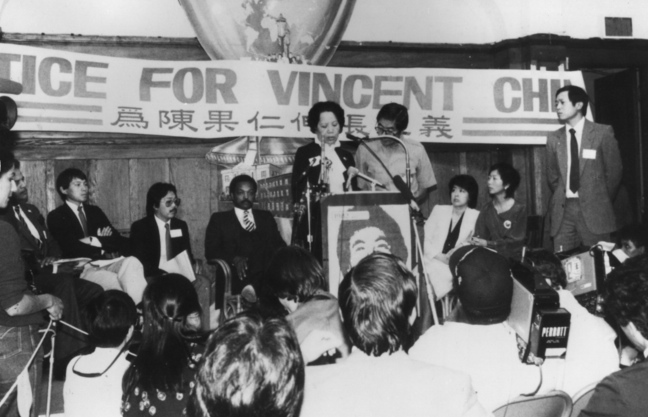 A “Justice for Vincent Chin” rally in the early 1980s. 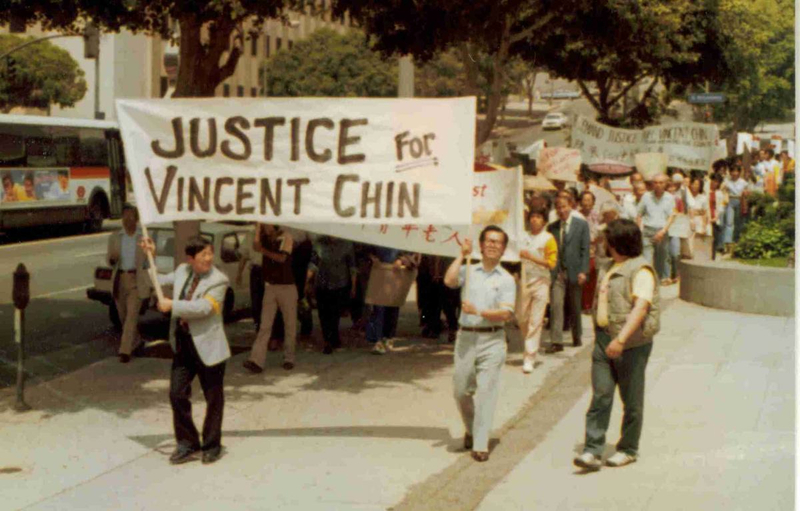 Asian Americans Advancing Justice, an affiliation of five civil rights organizations, on Monday began a week-long awareness campaign to commemorate the 35th anniversary of Vincent Chin’s murder. The campaign is marked by a new partnership between Advancing Justice and Communities Against Hate to report and track hate crimes through its website – a fitting tribute to the case that galvanized Asian American political consciousness three decades ago. On June 19, 1982, in the Detroit suburb of Highland Park, Mich., Chin, a 27-year-old Chinese American who was engaged to be married, was beaten to death by two white men who blamed him for their job layoffs, mistakenly identifying Chin as “foreign” and Japanese at a time when the Japanese auto industry was blamed for the demise of American automakers. The two men hurled racial slurs at Chin, trailed him out of a bar, where he had been having his bachelor party, and beat his head open with a baseball bat. Four days later, Chin died. “In their eyes, Vincent was ‘the other,’ a nameless representative of an entire race,” the Michigan Department of Civil Rights said in a statement marking the anniversary. When a local judge, citing the defendants’ lack of a criminal record, found them guilty of manslaughter and sentenced them to probation and fines without jail time, Asian Americans across the country were appalled and angered. The murder united communities of diverse and distinct Asian backgrounds to take action under the broad term of “Asian American,” giving stronger voice and identity to a long history of Asian Americans who struggled for civil rights in a nation that perpetually viewed them as foreigners. The “Justice for Vincent Chin” campaign resulted in a federal hate-crime trial and the conviction of Ronald Ebens, the man who wielded the bat, but the conviction was overturned on appeal. Ebens was found liable for Chin’s death in a civil trial, but has yet to pay the millions that he owes Chin’s estate. 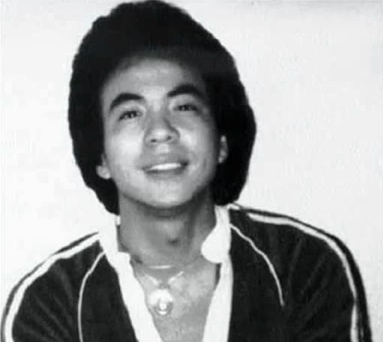 The case was examined in the 1989 documentary “Who Killed Vincent Chin?” by Renee Tajima-Pena and Christine Choy, which was nominated for an Academy Award, and the 2009 documentary “Vincent Who?” by Tony Lam, which pointed out that many young Asian Americans had never heard of Chin’s murder. “Thirty five years after Chin’s death, hate crimes against Asian Americans persist,” Advancing Justice said in a statement. “From the Hmong family whose house and car were vandalized with racial slurs, to the Portland woman wearing a hijab who was saved by heroic bystanders from a white supremacist’s harassment, to Srinivas Kuchibhotla, who was shot and killed in Kansas City, and to the large number of Sikh Americans who have been targeted, the past year has been rife with hate crimes against Asian Americans. “At Advancing Justice, we are raising the visibility of hate crimes among the Asian American community by tracking and reporting these incidents, including the upcoming translation of our hate-crime tracker into three Asian languages to be more inclusive of limited-English-proficient members in the Asian American community. Asian Americans Advancing Justice is a national affiliation of five leading organizations advocating for the civil and human rights of Asian Americans and other underserved communities to promote a fair and equitable society for all. The affiliation’s members are: Advancing Justice-AAJC (Washington, D.C.), Advancing Justice-Asian Law Caucus (San Francisco), Advancing Justice-Los Angeles, Advancing Justice-Atlanta, and Advancing Justice-Chicago. For more information, visit www.advancingjustice.org. Vincent Chin’s mother, Lily, speaks at “Justice for Vincent Chin” event that was also attended by Rev. Jesse Jackson. OCA–Asian Pacific American Advocates said in a statement about the anniversary, “This hate crime is one of many that have happened to Asian Americans and Pacific Islanders. In 2015 alone, 111 hate crimes occurred against Asians and four hate crimes occurred against Pacific Islanders. This is only a slight improvement from 2014, during which 140 hate crimes occurred against Asians and three occurred against PIs. “Vincent Chin’s case was the first time that federal hate crimes laws were used in an Asian American case. However, this case was still a huge loss to the AAPI community and revealed the need to address anti-AAPI bias. We must remain vigilant and push for stronger enforcement of these laws,” said Sharon M. Wong, OCA national president. Individuals can report incidents of hate at AAPI Hate Crimes Reporting Website, which can be found at aapihatecrimes.org. Hate crimes should always be reported to local law enforcement first. The OCA website only collects incidents of hate and does not report cases to the Department of Justice or to law enforcement. OCA–Asian Pacific American Advocates is a national organization of community advocates dedicated to the social, political, and economic well-being of Asian Americans and Pacific Islanders.